They had me at "balls." And then they put the word "Amaze" in front of it, and I knew I had to have them. Near my mouth. Because these Amazeballs were made for drinking. And I like whiskey. Though, I'm not too snobby about it, for that requires a desire to spend good money on good booze. Whereas I'm just as happy to spend mediocre money on mediocre booze. 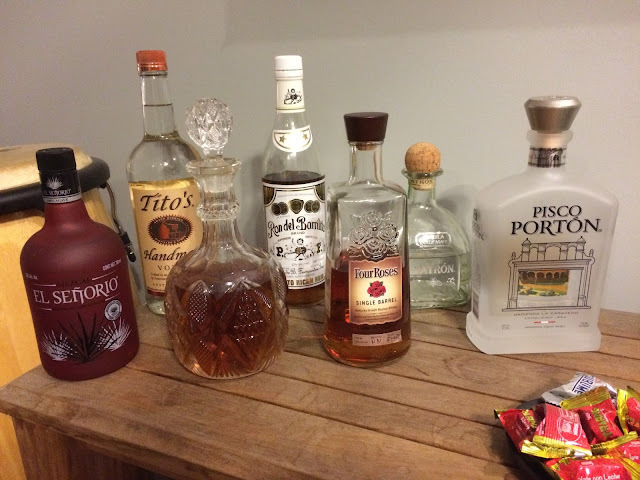 So, I usually just have a bottle of Jack Daniel's in the house, emptied into a fancy decanter because I enjoy the absurdity of pouring Old No. 7 from crystal. And I usually also have something else sitting around that's at least a little more decent. Right now that would be Four Roses Single Barrel. I drink it sometimes late at night when I listen to jazz. Which is not to say that I'm cultured or sophisticated. Sure, I might be swirling that Four Roses in a nice glass and enjoying some Coltrane, but I'm probably not wearing pants. For the fifth straight day. And I could use a bath. Regardless, I prefer to take my whiskey with a couple cubes of ice. I like it cold. Not necessarily watery. But cold. And that's where stainless steel Amazeballs come in. 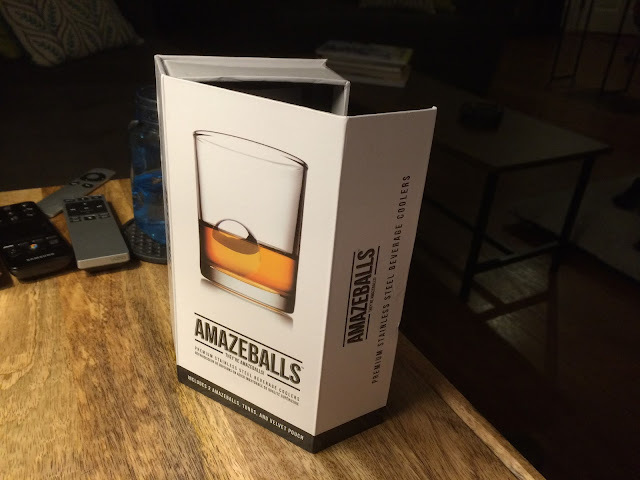 The packaging for Amazeballs is remarkably nice. The sturdy and attractive white gift box has a smart magnetic flap that allows you to open it up to see all four elements. This includes a small velvet pouch, tongs, and two perfectly round, perfectly weighted steel balls. The balls are filled with a glycerine gel that, after a few hours in your freezer, becomes nice and cold. I really shouldn't gush so much about the gift box. But it really is surprisingly well done. Much nicer than it should be for a pair of balls and a sack. Needless to say, it will look good on a store shelf. Which is important. One set of Amazeballs costs $25. Despite (or, perhaps, because of) the nice packaging, $25 is slightly on the high side. But everything seems premium. And they'll do well at your next holiday gift exchange. At least somebody will walk away happy. But not you. You're getting a ceramic angel. Yay. 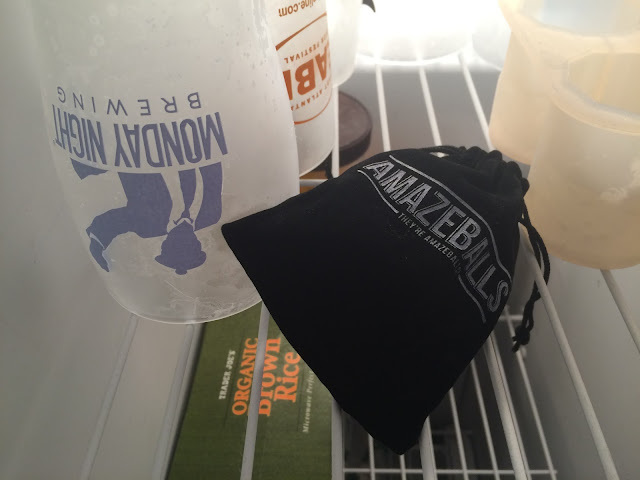 I put my balls in the freezer. 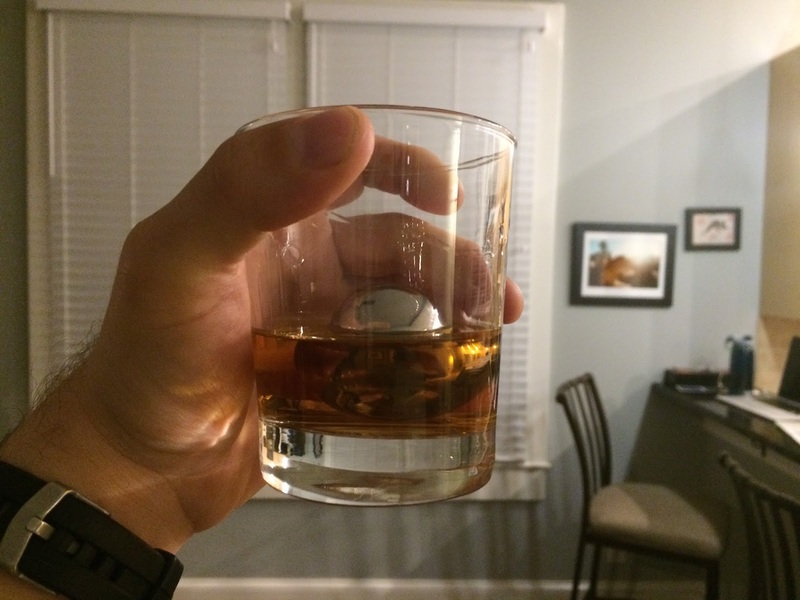 Later that night I poured myself some fancy-pants Jack. And then I gently placed one of my frosty, stainless steel beauties into the drink. Keep in mind - they're weighty. You don't want to drop your Amazeballs into the glass unless you also have an Amazebroom to clean up the shattered remains. Lo and behold, my drink turned cold. And it stayed cold. Which is basically what it promises. But I was curious as to just how cold. For this, I needed scientific evidence to show exactly how the Amazeballs were affecting the temperature of the whiskey. Thus, we begin a remarkably short and altogether unfulfilling story about how I tried to figure this out. At first I tried my digital meat thermometer. But it was broken. Wouldn't even turn on. Dead battery. This was odd because I've never even bothered to use it. Which is to say that, as a fan of charred animal flesh, I generally consider the meat done when it's tough enough to bludgeon a homeless drifter. Not that I would. But, you know, if I needed to ... I could. So, I did what I had to do. I drove to CVS and bought an $8 rectal thermometer. Because it had the word "rectal." Back at home, I unfurled my new temperature gauge and immediately sanitized it - just in case somebody at the factory decided to do a quality control test. Then I dipped it into my glass of whiskey. Apparently, this thermometer only reads from 89.6 to 111.1 degrees Fahrenheit. So, now I have a rectal thermometer. And you'll just have to take my word for it that the whiskey was cold. My biggest fear was that these things would roll down to the rim of the glass and shatter my teeth. And, I suppose if you went into full college-bro-dude chug mode, they might. But I'm capable of imbibing like an adult, despite the fact that in college, more than once, I drank beer from the beak of a plastic swimming pool duck. It made sense then. And, to be fair, it still sort of makes sense now. The beak has a good, natural flow. But, with Amazeballs, I was never in any danger of busting my teeth. With any reasonable tilt, they're heavy enough to stay firmly at the bottom of your glass. I mentioned before that the box also includes small metal tongs. I assume these are for taking a ball out of the sack and placing it in your glass without having to transfer body heat from your fingers. They also prevent you from rubbing your disgusting man-hands all over something that's about to go into another person's drink. However, laziness runs like a river through this house, so I never actually used the tongs. But if I was trying to impress someone important - like if Mayor McCheese came over to tie one on - I'd probably be more considerate and do it with a touch of class. Until then, the tongs will rest comfortably in the same drawer as all of my bottle openers. In the end, I give Amazeballs high marks. They work. I like them. And I suppose they're also a good conversation starter when somebody opens your freezer at a party. Perhaps the velvet bag full of steel balls will distract them from your collection of human heads. My only real concern is the price point. I think there's definitely room to include a couple more Amazeballs to make it a better deal. But speaking of deals ... only eight bucks for a rectal thermometer! Note: Use the code JARRETT15 to receive 15% off on your order at Amazeballs. "...pair of balls and a sack"....Hee hee, I see what you did there. you know... like a sack of balls. say no more jarett. i'm buying these.